Little Thoughts From Little People: Exams don't determine you| Colab's wanted! Exams don't determine you| Colab's wanted! Hey there! Today I want to talk about exam results and the problem with exams. I think I did a rant on this a while a go and I've wanted to do another since. Coincidently as I planned to do this, I was introduced to a video today which you can watch here, which summed up my feelings too. Many of you will have got results in the summer and some may be ecstatic, others not so and some completely disappointed. For those people who didn't do as well as liked, let this post serve as a little reminder to you that exams do not determine who you are. I myself was not particularly happy with my results, having felt like everybody seemed to have done better than me and thus making me feel like I was a "Failure." But something I cling on to and something which you may need reminding of is that just because you can't do the exam, doesn't make you any less smart. Exams, are not true representations of what you can do. You may not be "academically" smart, but that does not mean you are not clever. Intelligence comes in all shapes and sizes. If someone was bad at maths but great at English you wouldn't call that person thick because clearly maths is not their strong point. It's the same with people who are "Not good" at all subjects. Cleverness has nothing to do with how much you can remember for an exam. What does that determine? That you have a good memory? Intelligence depends on the person. For those of you who are lucky enough to have academic intelligence then that's great, but for some people, academic subjects such as maths, English and science it means it can leave them feeling like failers when in fact this is not true. That "F" you see on the paper does not determine who you are. Does that F show your kindness? Your ability to give advice? No, it doesn't. It shows how many equations you could remember which lets be honest, you're never going to use again. For some subjects like maths, you've either got it or you haven't, but for others such as English and art you're exam result is not a measure of how good you are at that subject either. Just because you failed English doesn't mean you're writing skills and ability are not good, it just means you probably needed to work a little more in technique. One of the most famous writers, Rohld Dahl was told by an English teacher that "He had never seen someone who persistently writes words meaning the exact opposite of what is intended." And yet he went on to be an amazing author. As you can see, your exam results are not a determination of you're overall intelligence or even you're ability in the subject. Everyone has weaknesses and strengths and some people are just not naturally good at school subjects. But that doesn't mean that if you're not, you have a future. In my opinion, life is about finding what you personally are good at even if its not an academic subject. Not everone can be good at school and that's okay, everyone is different. It does not mean however that you should not put in effort and try your best, but it does mean that because you can not pass subjects, it doesn't make you not smart. 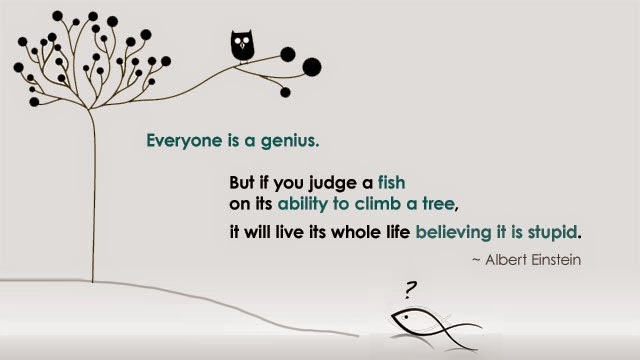 "Everybody is a genius, but if you judge a fish on it's ability to climb a tree, then it will live it's whole life believing that it is stupid." - Albert Einstein. I would like to end this post on a slightly different topic of reaching all you bloggers out there for collaborations. I think colab's are so much fun and creates new friends while promoting your blog and I have done some in the past and would like to do colab's with many more people, such as guest posts or "interview the blogger" type posts on each others blog's so if you're interested contact me at smitheh01@gmail,com.